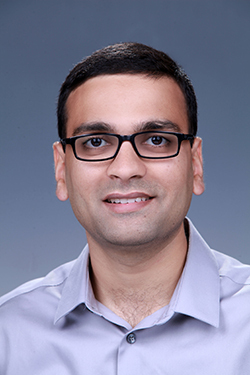 Varun Gupta, a scientist with ACMD Division’s Computational Engineering group, recently had his paper, “On the Enrichment Zone Size for Optimal Convergence Rate of the Generalized/Extended Finite Element Method,” selected as an “Editors’ Choice” pick for February 2017. The paper orginally was featured last August in Computers & Mathematics with Applications, a peer-reviewed Elsevier publication that focuses on science and engineering research, primarily using partial differential equations. The Editors’ Choice selection was made by Dr. Leszek Demkowicz, the assistant director of the Institute for Computational Engineering and Sciences at the University of Texas at Austin and current editor-in-chief of Computers & Mathematics with Applications. As part of being an Editors’ Choice, Gupta’s paper, co-authored with C. Armando Duarte from the University of Illinois at Urbana-Champaign, will be accessible for free until Monday, May 01, 2017. Gupta V and CA Duarte. 2016. “On the Enrichment Zone Size for Optimal Convergence Rate of the Generalized/Extended Finite Element Method.” Computers & Mathematics with Applications 72(3):481-493. DOI: 10.1016/j.camwa.2016.04.043.